Beyond the glittering halls of your 21st century resort, a city resplendent in history and culture awaits. Their arms flail wildly while their feet kick savagely at each other. Higher and higher they go, 20 metres, 25 metres, toward the dizzyingly high ceiling. The hero, in white of course, strikes the villain in the chest and he falls, arms and legs twirling, into the deep pool below. The 2000-strong crowd gasp, then gasp again when the hero falls too. Some stand to get a better look while others just cover their faces. But don't worry, it's all part of the show here at City of Dreams' spectacular $250million production, The House of Dancing Water, which plays to capacity crowds five nights per week. The award-winning 85 minute show, which opened in 2010, has enthralled more than 2 million guests with its 80 performers who high dive, motorcycle jump, leap, contort and dance around, in and on top of a 17 million litre pool. This awe-inspiring, super hi-tech show is the glittering centrepiece of the integrated entertainment resort, City of Dreams, opened in June 2009. With some 1400 guest rooms in three sprawling luxury hotels, plus more than 20 quality food and beverage venues and 175,000 square feet of sparkling retail space, there's almost no need to leave the resort. But in a city as rich in heritage and history as Macau, you'd be missing out on a wonderful sightseeing and cultural experience if you didn't venture out. Even though Macau is best known for its rich Portuguese heritage, the town’s maritime history dates back to the 5th century and earlier when coastal traders and fishermen used Hoi Keang, as it was then known, for resupply. 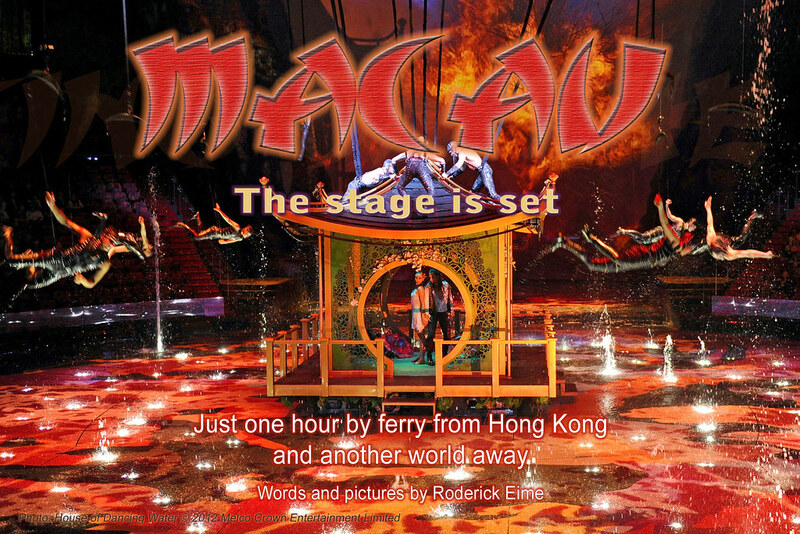 Macau’s unusual European cultural fusion has also spawned a range of colourful cultural events including arts, music and fireworks festivals, a dragon boat regatta and a marathon foot race. Golf and the legendary Guia Motor Race and Macau Grand Prix complete the international sporting calendar. Furthermore, the United Nations, through their cultural arm of UNESCO, recognised the very special significance of the architectural heritage of Macau by listing the centre of the old city as a World Heritage site of cultural significance. The imposing centrepiece is the preserved façade of the Cathedral of Saint Paul. Built during the last decade of the 16th Century by the Jesuits, the building was destroyed by fire in 1835. Rainy days are plenty around the middle of the year, a perfect opportunity to take in any of Macau's superb museums. For MOP$25 you can buy a museum pass for entry to the Grand Prix Museum, Wine Museum, Maritime Museum, Lin Zexu Museum, Museum of Art and Museum of Macau. And for a grand finale, if you want to outdo the brave high divers at The House of Dancing Water, you can strap yourself in for a 233m plunge off Macau Tower in the world's highest commercial base jump. There's thrills aplenty in Macau.